The Modi government was on Friday rocked by a 2015 defence ministry note cited in a media report expressing strong objections to the 'parallel' negotiations by the Prime Minister's Office in the controversial Rafale jet deal and came under fresh attack from Congress chief Rahul Gandhi. Stepping up his offensive on Prime Minister Narendra Modi, Gandhi demanded answers to questions raised in the media report, saying it is now 'crystal clear' that the 'watchman' is the 'thief', an apparent reference to Modi's alleged cronyism in the Rafale deal. Gandhi's offensive drew a counter-attack from Defence Minister Nirmala Sitharaman who dismissed the report in The Hindu newspaper on the internal note in the Ministry of Defence (MoD) dated November 24, 2015 as 'flogging a dead horse' and alleged that the opposition was playing into the hands of multinational companies and vested interests. As the MoD note led to a ruckus in the Lok Sabha and sparked a fresh confrontation between opposition parties led by the Congress and the Centre, Sitharaman also maintained that 'periodical enquiries' by the Prime Minister's Office (PMO) cannot be construed as 'interference'. Sitharaman, who also spoke to reporters, criticised the news report for raising issues 'selectively' and ignoring the then defence minister Manohar Parrikar's reply to file notings of officials. She said Parrikar had made a note asking officials to remain 'calm' as everything was 'alright'. 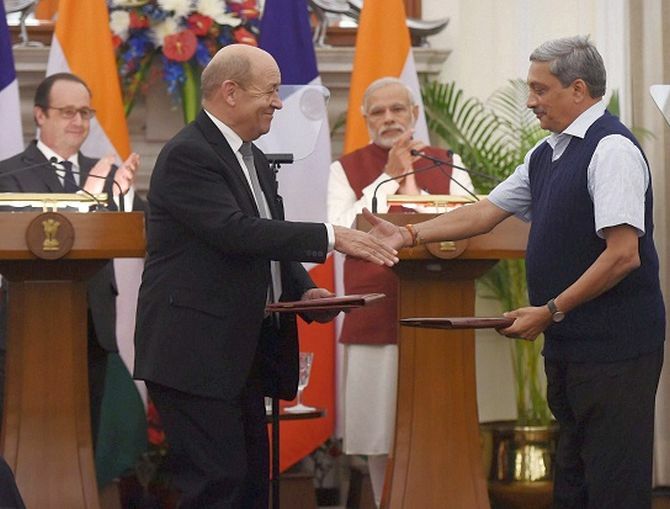 Parrikar's handwritten remarks at the bottom of the note said 'it appears that PMO and French President's Office are monitoring the progress of the issue which was an outcome of the summit meeting(between Modi and French President Francois Hollande in April 2015)'. Para 5, which referred to 'parallel discussions' by the PMO, 'appears to be an over-reaction', the minister wrote, adding defence secretary may resolve the matter in consultation with principal secretary to PM. Gandhi declared at a news conference that the Rafale deal was an 'open and shut' case, citing the report claiming the defence ministry raised strong objections to 'parallel discussions' conducted by the PMO during the negotiations over the Rs 59,000 crore Rafale fighter jet deal between India and France. Gandhi also brought in his brother-in-law Robert Vadra and senior Congress leader P Chidambaram to make his point in the escalating Rafale row with the Bharatiya Janata Party terming his allegations another 'lie from his lie manufacturing factory'. Former defence minister A K Antony said it was 'shocking' that the PMO was conducting parallel negotiations. "Whatever inquiry you want to do, you do it. You implement the law. Robert Vadra, P Chidambaram -- you implement the law on everyone. No problem. But you also give answers on the Rafale matter," he said using the report for a fresh offensive on Modi over the Rafale deal. Both Chidambaram and Vadra are facing probes by the Enforcement Directorate(ED) in separate cases. "We have been saying for more than a year that the prime minister is directly involved in the Rafale scam. "Now, today, in The Hindu newspaper, it is black and white... that the prime minister himself was carrying out a parallel negotiation with the French," Gandhi said. "It has been proven now that the watchman (chowkidar) is the thief (chor). What can be more clear than this?" he asked, reiterating epithets he has used several times earlier. Holding up the documents quoted in the newspaper, he said the then Defence Secretary G Mohan Kumar clearly objected to the interference by the PMO as it 'undermined out negotiating position seriously' going by the official notation in his own hand. Gandhi also read out from the Defence ministry note, published in the newspaper. "Now, it is crystal clear that the ministry itself has said, and I will read it to you, 'It is therefore clear that the parallel discussions by the PMO has weakened the negotiation of the MOD and the Indian negotiating team. "We may advise PMO that any officers who are not part of the negotiation team may refrain from having parallel parleys with the officer of the French government'," Gandhi said. Gandhi also alleged that the Centre has lied to the Supreme Court. "If Supreme Court had this paperwork, do you think that the Supreme Court would have given the judgement that they give? This was withheld from the Supreme Court. Of course. So that entire judgement is also in question." The apex court in December dismissed the pleas challenging the deal between India and France for procurement of 36 Rafale jets, saying there was no occasion to 'really doubt the decision making process' warranting setting aside of the contract. Addressing a 'Kisan Aabhar Sammelan' (thanksgiving rally) in Bhopal Gandhi cited the media report and alleged that the PMO was directly involved in conducting parleys with the French side and this had weakened the MoD negotiations on the same deal. Air Marshal S B P Sinha (retd), who was leading the Indian negotiating team for the Rafale deal, rejected the charge that the PMO was holding parallel negotiations, a view endorsed by Mohan Kumar during whose tenure the Rafale deal was signed. The comments of Sinha and Kumar were sought by PTI after the controversy over the MoD note broke out. Kumar said the matter refers to sovereign guarantee and not the price. There were several unsettled issues that were being sorted out and sovereign guarantee was one of it, he said, adding," All the price negotiations were conducted by the (negotiating) committee." In the Lok Sabha, members from the Congress, Trinamool Congress and Telugu Desam Party jumped in the well shouting slogans and showing placards referring to the media report. Mallikarjun Kharge of the Congress alleged that the defence ministry and the PMO were fighting on the issue and the matter has come out in the newspaper also. Amid the opposition uproar over the Rafale matter, Sitharaman made a suo motu statement defending the government. Several opposition leaders backed the Congress' stance and asked the government to come clean on objections raised by the defence ministry at that time with Aam Aadmi Party leader and Delhi chief minister Arvind Kejriwal going to the extent of demanding an 'independent' Central Bureau of Investigation raid to seize all related files and arrest everyone involved. West Bengal Chief Minister Mamata Banerjee accused Modi of being 'the master of corruption' and said she supported the views of the Congress on the Rafale deal. "Modi is chaiwala for polls, later he is Rafalewala," Banerjee told reporters in Kolkata. Communist Party of India-Marxist general secretary Sitaram Yechury alleged Modi had consistently undermined the Air Force and the defence ministry to benefit his 'cronies' in the Rafale deal. How much is Anil Ambani's Rafale deal worth?